“Collège” vs “Collégien”: why is the accent different? I recently found out that collège and collégien have different accents (accent grave and accent aigu respectively). But since collégien is from collège, I feel like they should have the same accent. Is there any reason for those words to have different accents? Or is it just because of phonetics? French's orthography is based on a dialect that only distinguishes /e/ and /ɛ/ in word-final position and otherwise uses [e] in open syllables (that don't end in a consonant) and [ɛ] in closed syllables (that do end in a consonant) and that always drops /ə/ (the mute e) between two consonants or at the end of a word. Répète /re.pɛt/ - répéter /re.pe.te/ - répètera /re.pɛt.ra/ - répétition /re.pe.ti.sjõ/. (Again, the orthography is adapted depending on whether the syllable is pé or pèt. "Collége" and "siége" were reformed to "collège" and "siège" in 1878. "Céleri" and "événement" were reformed to "cèleri" and "évènement" in 1990. Despite those reforms, some words remain of the ancient paradigm. In particular the prefixes dé- and pré- are never written dè- or prè-: hence the spellings prévenu and détenu, instead of the expected prèvenu and dètenu. Note that this is only a question of spelling, not of pronunciation. There is a tendency in most dialects toward having /ɛ/ in closed syllables and /e/ in open ones, but it isn't absolute for most of them. 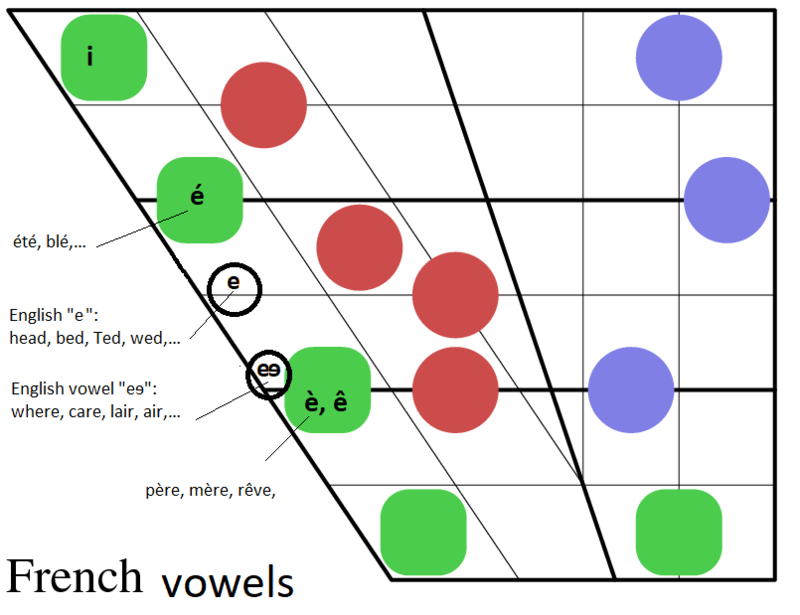 Any French speaker may depart from the above rules when speaking by pronouncing the /ə/ in the middle of a word and keeping the previous /E/ as a closed [e], by keeping the same vowel in a root whatever its syllabic structure may be, or by letting the height of the vowel in the final syllable influence that of the previous ones (so that "vous cèderez" might be pronounced vous [vu.se:d̪.ʀ̥̝e] and "il cèderait" [i.sɛːd̪.ʀ̥̝ɛ], which is what I do). As an aside, I'm a speaker of dialect that distinguishes /ɛ/ and /e/ in all syllables, whatever their position in a word or their structure and this orthographic convention caused me no end of trouble as a schoolkid until I understood -in college- the rules applied by the spelling authorities and how their phonological system differed from mine. When forming a derivative word in which the è is no longer followed by a mute e, the letter è is changed to é". Why are “an” and “en” pronounced the same? Pourquoi « an » et « en » ont-ils la même prononciation ? The meaning and etymology of “histoire de” / “histoire que”? What is the difference between “concurrence” and “compétition”, and why? Were “en” and “y” always used in French? What is the etymology of the word “dada” as it is used in French to mean “horse” (cheval)? Why “truculent” English and French meanings are so different? Why “déjà” with grave accent on “à”, not just “déja”?